In the United States, a strange phenomenon has been overtaking a good chunk of the population. People have been, albeit willingly, choosing to cut things like juicy steaks, delectable burgers, and fresh seafood out of their diet. Our Virginia Beach restaurant has had some of these…specimen… come into our restaurant and ask us which foods are “vegetarian” friendly—we’ve deduced that vegetarian is code for people who refuse to eat meat. Because we’re accepting of those who don’t always fit the norm, FireBrew is doing our best to understand these humans and we’ve laid out some of the pros and cons of their lifestyle. Okay, sure, nobody wants to be diagnosed with a life-threatening disease. The diet of the standard vegetarian is composed of foods like veggies, nuts, fruits, and other healthy ingredients—foods that naturally improve a person’s health and wellness. While we love gravy-covered everything and greasy burgers, we can’t help but commend the veggies for choosing a diet that will ultimately help them. Well, sometimes, we’d choose happiness over healthy if that meant getting to indulge in a juicy cheeseburger topped with cheddar-jack, bacon, thousand island dressing, and the likes. Sorry, vegetarians. You take your lower risk for cardiovascular disease, we’ll take our burgers. Everything in moderation, right? 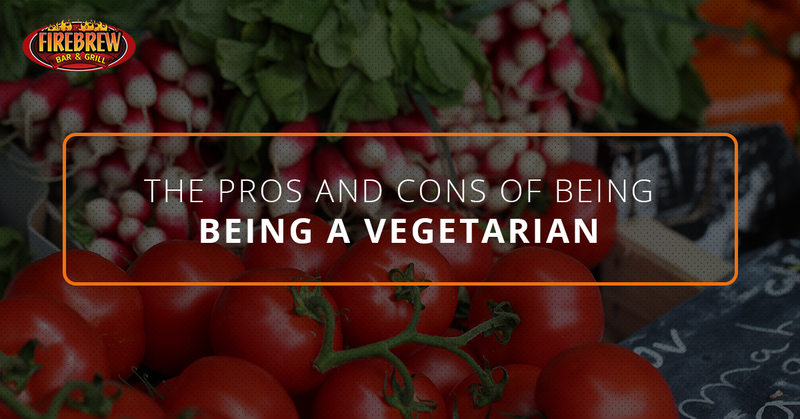 We can’t argue with the fact that vegetarians are a cheap date. While an omnivorous guy or gal might order that pricy surf-n-turf, a veg will likely stick with a salad, a veggie burger, or some pasta. That’s like a $20 difference right off the bat. Dating a vegetarian may be boring and frustrating, but it will also be quite inexpensive. Vegetarians will never understand the goodness that stems from the magical intersection of land creature and sea creature. Who knew that if you paired the two in a single dish that your life would forever be altered? Sorry, vegetarians, we win this round, on to the next one. We won’t hesitate to admit that a pizza sans toppings that was cooked with fresh ingredients and love is one of the finer things in life. Additionally, we’re partial to pizzas topped with fresh veggies like spinach, mushrooms, and tomatoes. It’s fresh, simple, and delicious. As a vegetarian, and don’t take our word for it, those people are quite temperamental, you can indulge in both plain pizzas and pizzas topped with plants. Doesn’t sound too bad, right? Sure, a veggie pizza is yummy, but it is NOTHING compared to a ‘za topped with sausage, pepperoni, or pancetta. Vegetarians will never understand the delight of taking a big bite into a fresh meat lovers pizza. Seriously, what’s better than a pizza topped with melted cheese, zesty sauce, and meat! Do you have an answer? We didn’t think so. A vegetarian diet is much better for the environment than one that’s filled with, well, animals. It seems as though a good chunk of the vegetarians are choosing this diet because they care about us and the Earth that we live upon and they’re not just doing this because they have some sort of rare brain disease. At FireBrew, we welcome herbivores, omnivores, and carnivores alike! Feel free to check out our diverse menu and come into our Virginia Beach Restaurant, today!